In 1856 the area around Sioux Falls was claimed by settlers, who considered the nearby Big Sioux River a desirable setting for a new township. What began as a small settlement with a population of around 40 inhabitants soon expanded into a large city of 10,000 by the end of the century. With a present day population of over 160,000, Sioux Falls is currently the largest city in South Dakota. It is also the seat of Minnehaha County, and spills into Lincoln County in the south. 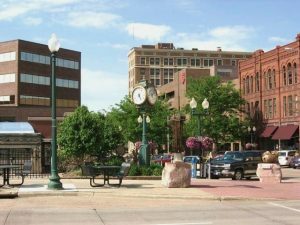 The city and surrounding metropolitan area account for almost a third of the total population of South Dakota and ranks in the top 50 biggest cities in the United States. The following will explore some common pest control issues among resident of Sioux Falls, including suggestions for the management and prevention of infestation. The climate of Sioux Falls is classed as ‘humid continental’ and is characterized by hot, humid summers and cold, dry winters. Historically, temperatures have exceeded -40 and 100 degrees at either extreme. Average snowfall is moderate at over 40 inches per year, while rainfall averages about 25 inches, most of which falls in the summer months. Severe weather events are possible in the area, including thunderstorms, gale winds and tornadoes. This, along with very hot and cold temperature, can lead to a high level of pest activity in Sioux Falls homes. A prevalent pest problem in Sioux Falls and other parts of South Dakota is home invasion by pest animals. From raccoons to squirrels, to birds (and other critters! ), pest animals can set up their homes inside attics and other vacant spaces in a home. Often, their presence is given away by the noise they make running amok in roof and wall spaces. Other times, their activity can be identified by other evidence, such as the presence of feces. Though these critters can be cute, they do not make for good house guests. Though they will typically keep their distance from people, pest animals can pose a human health risk as they spread germs and disease through their excrement, as well as the mites and bugs they can carry in their fur. Some can also transmit pathogens through their bite, such as rabies. To keep pest animals out of a home, it is advisable to take a few precautionary measures. First, tree branches near a home should be kept short and away from roofs, gutters and drain pipes. Additionally, external access points that critters may use to get inside a domicile should be patched up. Sometimes wire or mesh netting is the best solution here. If pest animal activity is suspected within a home, it is strongly recommended that a licensed pest removalist is contacted for assistance. They are generally highly qualified and certified to handle and remove these pests, and can reduce the risk of injury that homeowners face by attempting to tackle this problem on their own. There are a number of reputable pest control service providers located in Sioux Falls, including Bug Busters Pest Control, Eco-Friendly Pest Control and P & K Pest Control. These companies offer a range of pest control related services throughout the Sioux Falls area, including residential, commercial and agricultural solutions. To decide if these, or other pest control companies are right for your extermination needs, you can find out more about them online.